When one of our B2B clients came to us with the task of creating brand awareness at an upcoming international event that they could not physically attend, we had to get creative. We had to brainstorm quickly and on a tight budget. This international event is one of the biggest international trade shows for the industrial automation and robotics industry. With new competitors starting to come out of the woodwork, our client wanted to make sure they had a presence without spending the bulk of their yearly marketing budget to attend in person, advertise in multiple languages, or reserve a space and build an exhibit. After some brainstorming, our initial plan was to run a social media campaign during the week of this international trade show. During our research, we learned the event’s hashtag had already started to gain traction on Twitter and that many of the industries leaders had a large presence on the platform. Because of this, Twitter became our primary focus, followed by LinkedIn and Facebook. LinkedIn is a great platform for B2B opportunities and Facebook would help build both credibility and additional brand awareness. One big hurdle stood in our way! The client’s social media presence had been MIA for over 6 months, platforms had only been used very minimally (we’re talking about a total of less than 15 posts across all platforms! ), and their following was small and inactive. How could we use social media to generate a buzz about our client and their product if there was no following listening to us? 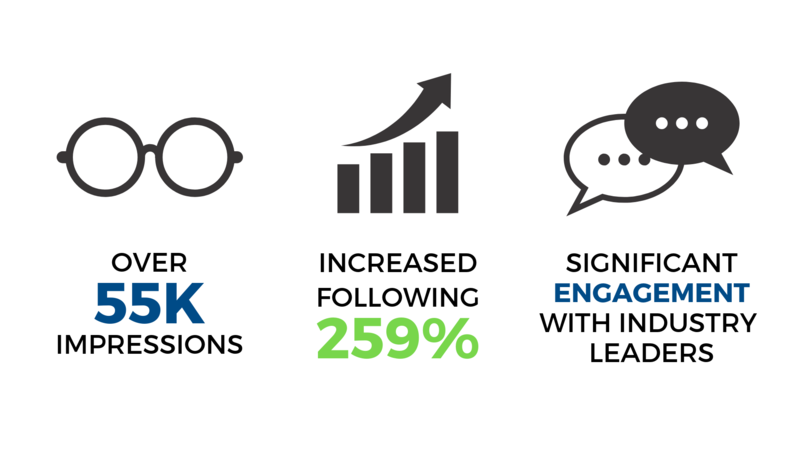 As soon as the campaign kicked off, we began to see immediate growth in our client’s following. Being active and engaging with potential customers and industry leaders on a daily basis helped to create a buzz and an awareness around the brand. Did you know customers, in both B2B and B2C, need to come into contact with a brand or product an average of six times before engaging for a potential purchase? This shows the importance of consistency! With an average of a 259% organic growth rate in our client’s following across all social media platforms before the event even took place, we set ourselves up for a great week of engagement and awareness throughout trade show. We even saw a rise in followers and views on YouTube, a platform that was not a focus within our strategy due to time and resources. Both our social media campaign and strategy for brand awareness were a success! After so much engagement during the international show, our client’s following has continued to grow and become a prominent Twitter account within the industry. Consistency and engagement are key in organic social media campaigns and it proved true once again, even when our target audience was on the opposite side of the globe!